Paul Peterson/For the Gazette L’Anse’s Breanna Kieinz battles a group of Chassell players, including Lela Rautiola, 24, for a rebound Monday night in district tournament play in Chassell. The Panthers notched a 36-30 win. 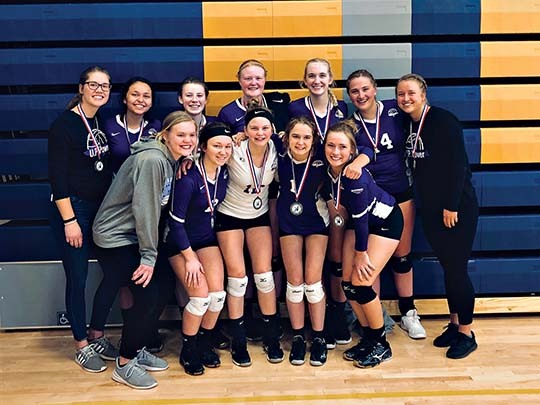 CHASSELL — Turning the tables on the L’Anse Purple Hornets, the Chassell Panthers avenged a regular season loss from last week in girls basketball Division 4 District 98 Tournament play Monday night. In a close, hard-fought battle during which no side led by more than four points until the very end, the Panthers’ clawing defense made the difference in the end. L’Anse skipper Scott Lloyd said the Panthers put more pressure on his team than a week ago. Down by a 23-22 score heading into the final stanza, Chassell took the lead for good at 28-27 with three minutes left on a pair of free throws by Carly Goddard. 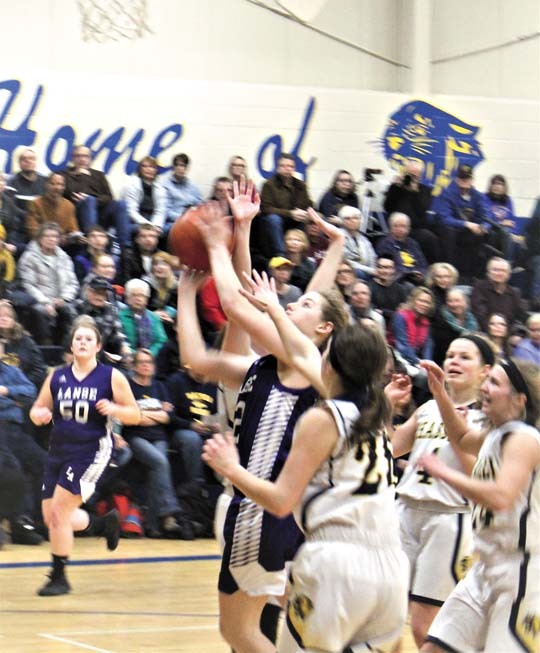 With the Purple Hornets pressing hard, the Panthers managed to spring Paige Sleeman loose for two breakaway layups. That essentially iced the contest. Sleeman — in and out of foul trouble all night — netted six points in the final period. Lloyd said his team was outworked. After grabbing a 9-6 margin after one quarter, L’Anse was outscored by a 12-5 count in the second quarter. Senior Jenna Pietila, the only returnee from last year’s great Chassell squad, netted a three-pointer to spark the rally. But the Hornets eked out a one-point lead in the third quarter as five points by Josie Rice were key. Then came the closing burst by the Blue and Gold. The victory boosted the Panthers to 15-7 on the season. They will meet winless Dollar Bay on Wednesday in a semifinal test. Sleeman said his team will not take the game lightly. Pietila led Chassell with 14 points and four steals, while Sleeman added 10 points and a team-best five rebounds. Rautiola added eight points and Goddard, credited by her coach for “playing a really good game,” added four points and four steals. The Hornets, closing at 10-11, received 11 points and 9 rebounds from Maija Rice. Josie Rice added 10 markers. LHS: J. Rice 10, Mattson 5, Voskuhl 4, M. Rice 11. FT: 6-13; Rebounds: 33 (M. Rice 9); Fouls: 11; Fouled out: M. Rice; 3-point field goals: Mattson 1, J. Rice 1. CTS: Pietila 14, Rautiola 8, Sleeman 10, Goddard 4. FT: 7-8; Rebounds: 23 (Sleeman 5); Fouls: 14; Fouled out: none; 3-point field goals: Pietila 1.